Breezy (who author's The Blonde Oxymoron which is a fabulously funny blog) and BestSonInLawEVER had to bring one of their dogs home for Christmas. Normally, we don't have the other dogs come because they all weigh at least 80 lbs and our house is a whopping 1300 square feet. Looks like Rico was ringing in the new year a bit early! At least he doesn't drive! that poor dog, he needs help!!! tell him the first step is admitting he has a problem. Jen- I'll pass it on to him. LOL Happy New Year! Priceless! 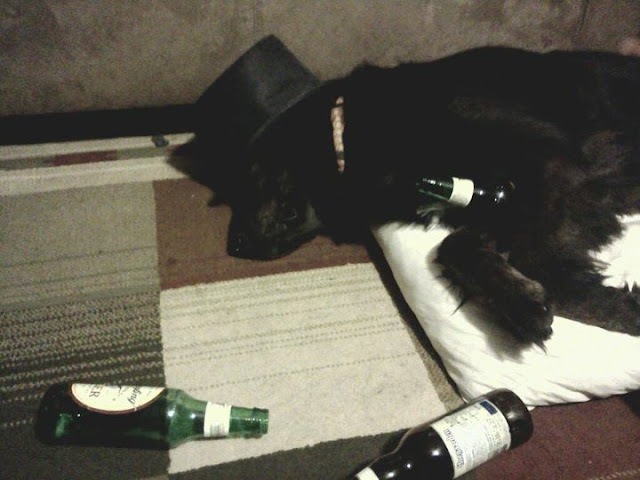 He will need some doggie Advil when he wakes up. LOL! Your kids are hilarious. Now there is a party animal if ever I saw one!! Wasn't it wonderful having the kids home over Christmas!!! And now that the last has left (about an hour ago), it is deathly quiet - except for Misty snoring. Kim-Weren't those just the cutest?! My kids are such jokesters! Judy- It was fantastic! And it's deathly quiet here too. I have enjoyed your friendship as well! And your marvelous soaps! Which I need to order more of soon as the lovelies used up most of them over the holiday! What a perfect wish! I'll wish you the same! Happy New Year! Ha! Ha! 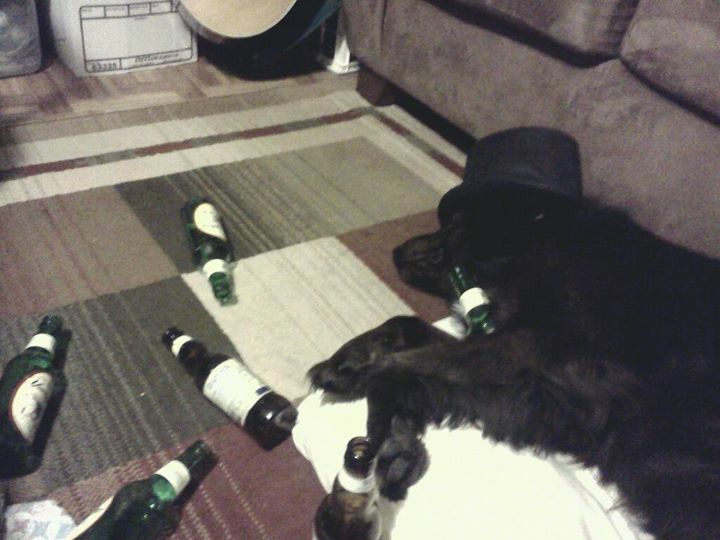 Such cool photo's - what a party-animal eh?! Happy New Year to you and your's! Eva- Happy New Year to you too my wonderfully talented artist friend! That was so darned fun to view. What adorable, hilarious, and yet....sobering photos. Thanks for visiting, and have a happy new year. Anni-Thanks! Rico is such a laid back dog. He let's them do whatever. Good thing they love dogs and are nice to them! Happy New Year to you too! Those photos are hilarious! And Rico is a good sport...what kind of dog is he? He looks a bit like a Newfoundland. MD- Rico is a mix: border collie and golden retriever. I think. He is a good sport. And I love him but not so much his fur. Tucker doesn't shed so I'm not used to dog hair everywhere. And, by everywhere, I mean- EVERY-FREAKING-WHERE! 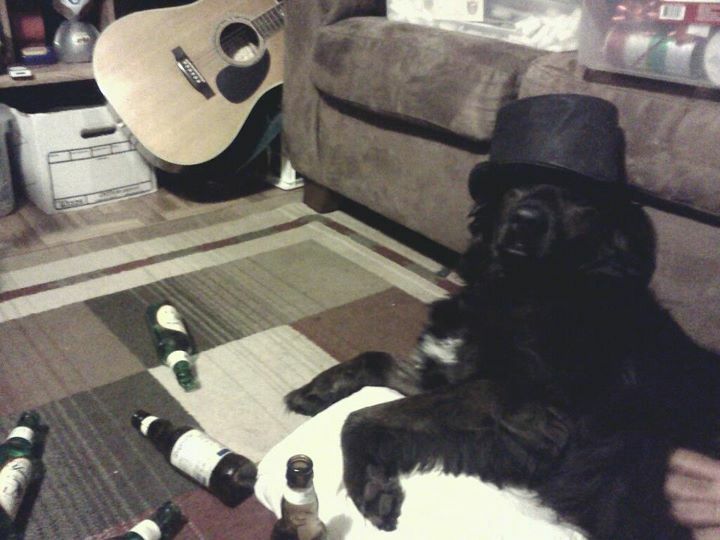 That dog looks awesome in a hat! And your kids are a riot indeed!!! Robin- He does sport a hat well, doesn't he? LOL They are indeed! Thanks! Diane- We just couldn't believe he went through all that beer! LOL He's quite a sport that one. Thank you so much! Happy New Year to y'all too! Big hugs! That is so cute, so I bet he is grounded after than stunt. :) I am glad I got to know you this year, I look forward to 2012. I am glad you got to have your girls around I know it just feels so good. I am going to say good bye to 30 pounds. I am sick of having them as my closest companion. Just sleep it off, tomorrow will be better. If you can eat a big bowl of Menudo in the morning,should help with the hangover! Happy New Year and thanks for the websites! Oh my! Tell me he didn't drink ALL of them! That's hilarious. And he looks so partied-out. FG- It was fabulous having them all here for Christmas! And such a downer when they had to leave. I miss them already. Let's keep in touch and keep each other accountable on the weight issue. I still have "miles to go before I sleep" so to speak! Happy New Year! Shawn- Isn't he the cutest?! You are quite welcome! Happy New Year! Stephanie- Yep. Every single one. LOL He's such a sweetheart! Happy New Year! Happy New Year, may all your dreams come true.